Video shows abnormal torsion and left leg distortion during fall. Afterward Lanzinger wants to lay in fetal position and brushes off aid while in obvious pain (not shown in this video). The double fracture, that occurred during a Super-G, severely damaged blood vessels, hampering circulation in the 27-year-old skier's leg. The Austrian ski federation said the surgery Monday night was only partly successful and left doctors no other option in an effort to avoid further risks. Race organizers in Kvitfjell, Norway, were criticized because no medical helicopter was available. Lanzinger was flown to a hospital in Lillehammer in a tourist helicopter, and then to Ullevaal University Hospital in Oslo, Norway. Professor Thomas Holzenbein, an eminent angiologist from Salzburg was called in as a consultant. 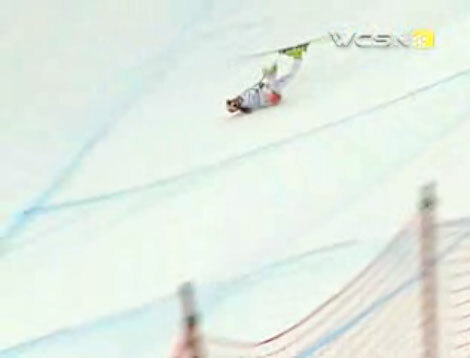 TUE MAR 04 2008 — OSLO, Norway — Austrian skier Matthias Lanzinger’s lower left leg was amputated Tuesday because of complications from a fractured tibia and fibula in a crash at a World Cup race. The double fracture, that occurred during a Super-G, severely damaged blood vessels, hampering circulation in the 27-year-old skier’s leg. “As a result of irreparable tissue damage an amputation to avoid lasting serious damage is unavoidable,” the Austrian Ski Federation said in a statement.